The HamSphere 3-element 3-band Yagi is one the antennas in our series of "Classical HF Antennas". the world over by HF ham operators since decades. 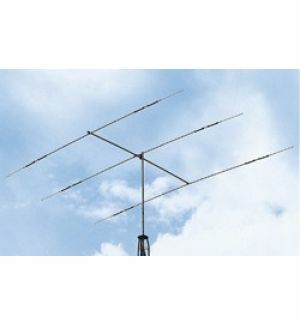 One may find such an antenna available from almost every manufacturer in the world. It is a very nice real-world antenna with good performance and relatively smaller size. It offers a robust construction and is possible to install where space is at a premium. The turning radius of a multi-band trap Yagi is far lower than equivalent monoband antennas. Shortening of element lengths is achieved on account of the presence of traps. slightly lower gain on the 15m band. This type of power gain distribution is typical for a Triband Trap Yagi. excellent azimuth view in excess of +/-45 degrees. It offers a good coverage for both mid-range as well as long-range DX work.